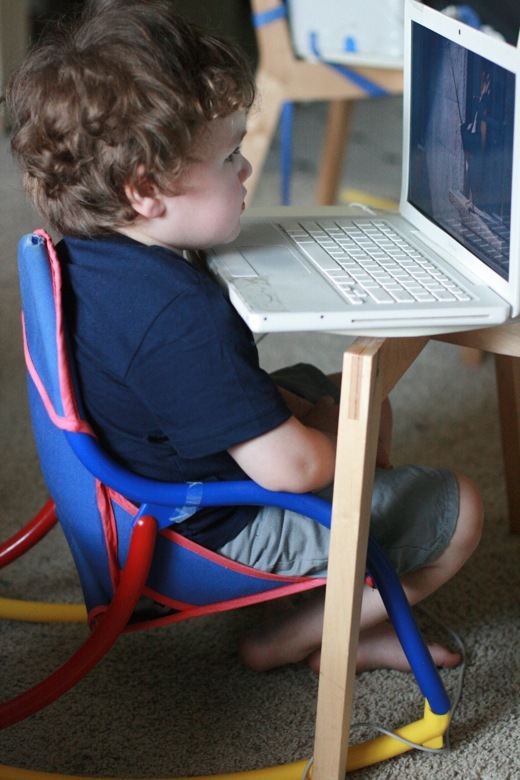 Hobo Mama: Wordless Wednesday: Didn't this kid's mother warn him not to sit too close to the TV? Wordless Wednesday: Didn't this kid's mother warn him not to sit too close to the TV? And to read more about the parenting philosophy of parents who grab the camera before suggesting to their son that he scootch back a bit, check out yesterday's Carnival of Natural Parenting post written by my partner(-in-crime), Sam. You'll also love this week's delightfully messy and creative photos on the topic of Art over at Natural Parents Network! 1. Natural Parents Network ~ Art ~ with linky! Haha this is totally Abbey! She rests her head on her hands with her nose like two inches from the TV and I always tell her "move back please - I can't have you burning your eyes!" Now every once in a while she sees me coming from the other room and she looks at me and says "My eyes aren't burning mommy." yet another place to edit my parenting. Maybe I'll have to put a bring red tape line down to show how far she needs to sit away from the screen while watching PBS lol. Cute! I love how everything is kid sized. That mouse pad is the perfect place for his chin! Heehee. Mikko is too adorable. Hilarious! I'm definitely guilty of grabbing the camera when I probably (maybe?) *should* be intervening first. How else would we document these things! ?